Benson, Brent and Beck: what’s the connection and who among them is Shania’s ‘show-off’? There are some slippery, speedy moves which may be familiar, but if you’re not used to playing without a pick then the repetitive plucking might put a strain on your muscles – take it easy at first! I’ll explain the connection between the above named players in a moment, but first I’ll answer the question concerning which of them plays guitar on Shania Twain’s album, Come On Over which, incidentally, has become the biggest-selling country album ever! Shania (Country Music Association Entertainer of the Year) can boast to having Nashville’s number one country picker (CMA Musician of the Year winner once again), Brent Mason, who plays ‘licks and solos’ according to the album’s credits. Plus, she has had the amazing services of Nashville’s other hotshot, Dann Huff (who produced Lonestar’s Amazed – and Megadeth, too!). Now, I’ve written lessons in the style of both these players before on more than one occasion, so what’s the story this time? Well, it’s simply the mega success of the album that has generated so much interest in the album’s plentiful guitar solos (played by both Brent and Dann), so I’ve been asked to revisit the technical side of things one more time. I’ve opted for a strong bias towards Brent Mason, who plays with a thumb-pick and fingers (like Chet Atkins does, and Steuart Smith, plus Jerry Donahue, too, of late), although Brent’s style is really quite unique and invariably breathtaking! This brings me to the connection that I said existed between Brent and the others I mentioned (Benson and Beck). You see, Brent is a huge fan of top-flight jazz guitarist George Benson, and there’s also the fact that Brent plucks using his fingers (i, m and a) a lot of the time to get the snappy, popping sound that is so well-suited to the country chicken-picking style. So there is, in my view, a strong likeness to the (flesh only) style of rocker supreme Jeff Beck. I think it really is quite obvious if you listen to some of Brent’s more aggressively plucked stuff as compared with Beck’s output from time to time (see the recommended listening box). By the way, I can hear a hidden influence as well in the form of the late, great Roy Buchannan – part country, part blues, 100 per cent genius – who surely influenced Jeff Beck. So, this lesson draws on a rich and varied guitar playing heritage and, though I didn’t think about at all, I gravitated towards fingerstyle on the audio track. I didn’t purposely try to play like Brent although I’m happy to say that my improvised lead guitar work represents a good workout in itself; it’s a challenge that is certainly in the style of Mr Mason. Oh, there are also some moves that indeed sound like Dann Huff, so he’s not forgotten. Let’s begin, then. The solo’s entrance most definitely sounds like Jeff Beck. It’s all to do with plucking using flesh only (the absence of a pick in your hand slightly affects the orientation of your hand, so ‘palming’ a pick may be not such a good idea). Anyway, the Bb9 in the intro isn’t particularly ‘country’ – but who cares? Just a small point: the way I played that chord while laying down the rhythm guitar accompaniment is different from the way I played it when soloing, which is just an idiosyncrasy (see chord diagrams). Whatever, the intro is particularly brassy: think ‘babap-bap’. Bar 4 sees a move from a Gsus4 chord to a C blues scale-based lick that fits the impending chord: C enables some nicely tense-sounding stuff to work even when the theory (harmony and tonal-centre issues) may not suggest that it would – be brave, then! Towards the end of bar 5 there are some chromatic 6th intervals but, to avoid predictability, they rarely move in parallel (in practice this solo uses a lot of pedal tone ideas). Now would be a good time to mention the frequently heard syncopation (unexpected off­beats that are accented), which in this particular solo often involves phrases that have the downbeat silent, closely followed by an off-beat attack one-sixteenth later. This serves to make the music sound rather funky. You might find it surprising to learn that I played a rather pretty sounding succession of sixths in bar 7 – as opposed to all the greasy, bluesy stuff heard elsewhere. Hey, I’m neither proud nor ashamed of what I did because the end result works just fine. Still, I think I must have been aware of my tendency towards sweetness because in the next bar I deliberately livened it up with a Jerry Donahue/Brent Mason-style bend as part of a double-stop (see bar 8). The bluesiness continues into bar 9 as the chord changes to F7, the IV chord. Do I sound like Jeff Beck or James Burton there? Or perhaps Albert Lee? In bar 12 I think I really do sound like Albert and I’m proud to say it was totally off the cuff. Oh, I really should mention Jerry Reed here because he’s a big influence on most of the players I’ve mentioned in this lesson. Brent Mason has indeed admitted the influence of Mr Reed. It’s at the end of bar 14 that the Dann Huff moves appear: sliding 4ths. Sliding 4ths can fall into either the soul or rock camps depending on your attitude (and amp settings!). For added interest, I simply shifted the 4ths up an octave while heading into bar 17. I vaguely remember wanting to sound a bit like Chet Atkins as I negotiated bar 19 – plenty of lovely 3rds, then – plus a bit of chromaticism for extra interest. Bar 20, sparse though it is, reminds me of Larry Carlton or perhaps Vince Gill – although it could be anybody, such is its simplicity in terms of phrasing! As the solo was coming to an end in bar 21 and beyond, I made sure I wasn’t conscious of anything or anyone in particular – I just went for it in time-honoured fashion. I wanted to sound gutsy and show attitude, and to that effect I dug in, paused, held back, grunted, then I fell into a heap on the floor! I finished by wanging my wang bar just because it hadn’t been used yet! Finally, and on a more serious note, may I take this opportunity to sum up my approach to teaching, whether it may concern this lesson or any other: it’s what the player is thinking of and why that really interests me (and sometimes foxes me too!). I’d rather tell you about how things came about than just say, “put your finger here and there”. I feel I should endeavour to instill a sense of adventure in you, plus boldness and heightened creativity. Anyway, that’s enough of me, take a look at the music. 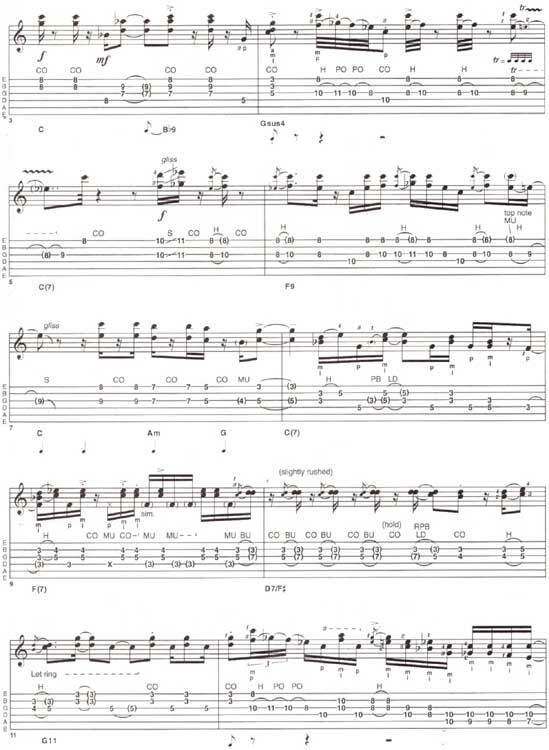 It’s a part of Shania Twain Country Lesson guitar tab and sheet. © 2012 - 2019 TabsClub Powered by TabsClub 42 queries in 0.333 seconds.